"Barack Obama", "CARD Act", "consumer protection", "credit card reform", "credit cards"
President Obama signed into law major credit card reform in May of 2009. Big banks, in their usual fashion, have complained that the reforms are too restrictive and that it would hurt consumers. They never mentioned just how much credit card debt hurts consumers. Most of the reforms went in effect in February 2010, with the rest taking effect on August 22, and with creditors making changes throughout the last year. Let's discuss the reforms that will help you, the consumer, first. Then we will briefly go over the state of the falling credit card balances since reform has been proposed and enacted. The right to know and the right to leave: The first thing to go into effect was last August, since when creditors have been required to give 45-day notice to consumers on changes in credit card terms, including interest rates. Since then, credit card companies have also been required to give consumers at least 21 days (as opposed to 14) to pay their monthly credit card bills. Not only that, if you don't like your new terms or interest rates, you have the right to opt-out, cancel your card, and pay off the balance under the older terms and previous lower interest rates. The right to know the minimum payment scam: When you get a credit card, and you get your statement, there's a nice little minimum payment on your bill. You figure, hey, that's not much! I can pay that every month! And you use your card more and just pay the minimum. Before you know it, you are in debt over your head and those minimum payments never seem to stop. You see, your credit card company never told you that the minimum payment is their way to earn a monthly check from you for - well, essentially for life. Now with the new law, the creditor must tell you how long it would take you to pay off your balance if you only made the minimum payment, and also how much you'd have to pay monthly if you wanted to pay off your balance in 36 months. Ending universal default for existing balances: Your credit card company can no longer hike interest rates on existing balances under "universal default," a dirty industry practice that raised your rates based on your credit history unrelated to your credit card account (such as your utility bills). That history can now only be used to raise rates on new balances (i.e. balances incurred after problems with other bills), and even then the creditor must give you the 45-day notice, and you reserve your right to opt out. Ending loan sharking on college campuses: Young adults under the age of 21 can no longer get a credit card without a co-signer, unless they show themselves capable of paying the balance with an employment history. Creditors cannot offer food or t-shirts in exchange for filling out a credit card application at a college campus. Restricting loan sharking of the poor: The poor are often lulled into sub-prime credit cards that charge an up-front fee that eats up their credit limit quickly, and they can go into huge debt without purchasing a single item. The new law restricts those fees to no more than 25% of the credit limit in the first year of the card. Credit card companies are threatening to make up the loss by hiking the interest rates on these cards instead, but at least interest is paid on things people actually purchase and not simply on the privilege of giving the credit card company the opportunity to rob you simply by opening an account. If your payment arrives at lunch time on the due date, it's on time: Anyone who's ever been hit with a late fee from a credit card company and thought they paid on time has probably had the experience of calling them and finding out that even though your payment arrived on the due date, it was due at 7:30 in the morning, and, well, you are outta luck. The new law outlaws that abusive practice, and makes 5:30 pm the deadline on the due date. Highest interest debt paid first: One of the ways credit card companies make money is by charging interest on top of interest. Say you have a balance with a credit card company, and the balance consists of the usage of the card at different times when you had different interest rates. You make a payment that exceeds the minimum balance. Your credit card company used to take it and put it to pay off the lowest interest rate debt. That way, your higher interest debts would be allowed to accumulate more and more interest on top of interest. Clever, huh? The new law ends that practice. The new law says that any payment in excess of the minimum must go to pay off the highest interest debt first, followed by the next highest interest debt, and so forth. Finance charges on the current cycle charges only: Another way for credit card companies to bilk the consumer is to slap you with finance charges. They used to calculate your finance charges based on your entire balance - even the balance carried over from previous months, referred to sometimes as "double-cycle billing." The new law makes it so that finance charges are computed based only on the purchases you make in the current billing cycle, not on your outstanding balance from previous cycles. No more "inactivity" fees: Credit card companies figured out this game pretty good. They could charge you for using your card. But they could also charge you for not using it. It was called an "inactivity fee." They had you coming and going. That windfall ends as of August 22, 2010. Inactivity fees are outlawed. Restrictions on late fees and ban on multiple fees: Late fees are limited now to $25 unless you have had a late payment in the last six months or the bank can show that real costs associated with the late payment warrants a larger late fee. Your credit card company also can't rack up your fees by stacking one on top of the other. For example, they cannot charge you both a late fee and returned payment fee for a bounced check. Over-limit fees for opt-in only: Credit card companies can no longer slip in an over-limit fee when you go over your credit limit without noticing it. They must now have you opt-in to a over-limit program, otherwise, your card will simply be declined when it goes over the limit. No fees on gift cards for the first 12 months: There's another scam by creditors. You buy a VISA gift card for your cousin's birthday, not knowing what she'd like, and besides, everyone can use money. But little do they tell you that the issuer of the card will be taking a nice $3 from the card every month whether or not your cousin uses it. If you gave her a $30 gift card and she hasn't used it for 10 months, planning to spend the money when she goes shopping for her winter clothes, she is going to find out that the balance on the card is zero. Well, no more. No more gift card fees for the first 12 months of activation. In addition, the terms of "dormancy" and other fees on gift cards must be clearly disclosed. But what if you bought a card that doesn't have those monthly fees? That's awesome, isn't it? Well, your issuer thought of that too, and they probably put an expiration date on the card - say your cousin has to use all of it within a year of first using it, or she loses the balance. The new law catches up. Gift cards also cannot expire before five years under the new current law. Ending "free credit report" scams: Beginning April 2010, companies claiming to provide "free" credit report has had to tell you the report isn't actually free (in that it requires you to sign up for a bunch of nonsense to ruin your credit further), and that AnnualCreditReport.com is the only federally authorized source for your credit report which you have a right to. U.S. credit-card delinquencies tumbled in the second quarter as individuals' average balance hit an eight-year low and nonpayments dropped at the fastest pace since the end of 2007, according to consumer-credit rater TransUnion. The announcement comes as Americans have cut credit-card use for 21st-straight month through June, according to the Federal Reserve. So not only have the banking industry talking points of this bill hurting consumers failed to materialize, on the contrary, Americans seem to have taken advantage of the new rights and disclosures created under the new law to cut down on credit card debt. But wait, you say. The economy has been in a slump, and credit is naturally tight. Couldn't the dwindling balance simply be the result of the credit crunch and Americans spending less? A lot of it probably is. But a horrendous economy and restricted consumer spending do not account for why the non-payments for credit cards are dropping. Generally in a tough economy, Americans rely on credit cards to buy essentials, so the balances may even go up. 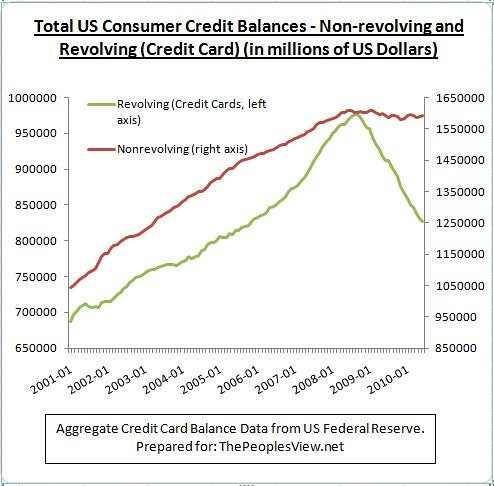 In fact, throughout the recent economic contractions, credit card balances (which makes up what the Feds call "revolving credit") have continued to rise, according to Federal Reserve Data. The only significant and sustained slump has come in the last 20 months or so, coinciding with the procession and eventual signing and implementation of the credit card legislation. Notice that non-credit card consumer credit balances have flatlined over the Great Recession, while the credit card balances have fallen. If the fall in credit balances were attributable completely on the economy and the credit crunch, non-credit card consumer credit balances would also be falling at a comparable rate. I will be discussing specific consumer credit card use patterns in light of reform in another post in not too distant future, but for now, I wanted to point out that the significant consumer reforms Democrats and President Obama have enacted are the right reforms, and they are helping consumers deal with the mountains of debt from the credit card industry. Nov 1 So I Guess Financial Reform ISN'T Costing Consumers?